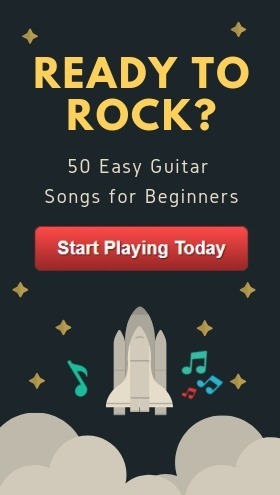 When was the electric guitar invented? Where was the electric guitar invented? When was the acoustic guitar invented? Where was the acoustic guitar invented? The first electric guitar was invented by George Beauchamp and Adolph Rickenbacker, his business partner. Beauchamp was awarded the first patent for a guitar with an electric pickup. The acoustic guitar, on the other hand, has a very long history stretching back thousands of years. The oldest preserved instrument most closely resembling a guitar is dated at 3500 years (~1500 BC) and belonged to Har-Mose, an Egyptian singer. It’s the early 20th century and the popularity of acoustic guitars is on the rise. Everywhere you go you either know someone who plays an acoustic, or you’ve heard one being played on stage. Life is good, right? Well… not exactly. Acoustic guitars had a big limitation: They were too quiet when played on stage alongside woodwind and brass instruments. In other words, it was impossible to hear an acoustic guitar over the strong, bold tones of brass, orchestral, and woodwind instruments . You just couldn’t play an acoustic guitar in a band! 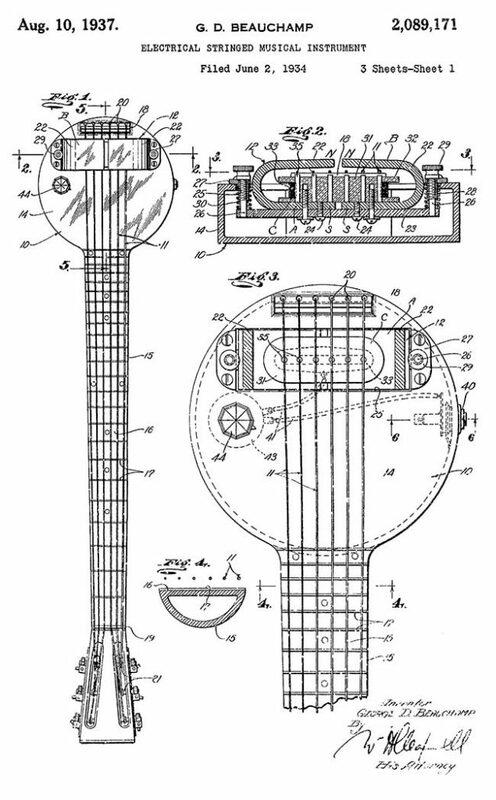 This was a problem all the way up until 1937 when George Beauchamp and Adolph Rickenbacker finally received their patent on the first electric guitar: the Frying Pan (as it was nicknamed). The new technology patented here was primarily the electric “pickup”, an electromagnet that wrapped around the steel strings of the guitar like a bracelet. This “pickup” was able to successfully “pick up”, as the name suggests, string vibrations within its magnetic field. These vibrations were then converted into electric current and sent as an output that could then be played through speakers, amplified, and manipulated. In our modern electric guitars today we no longer have "ring" pickups that surround the strings; the pickup sits at the bottom end of the guitar. It took inventor Beauchamp and his partner Rickenbacker over five years to perfect their patent. But persisting through the struggle was well worth it. They solved the volume problem acoustic guitars had experienced throughout the entire first third of the century. 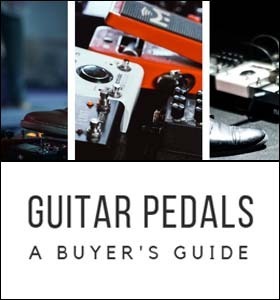 Today, electric guitars are played in rock bands and by aspiring musicians every single day - something that wouldn't have been possible without Beauchamp & Rickenbacker's invention of the pickup. They started the "evolution of the electric guitar", moving them closer to how our electrics are built and manufactured today. This pushed modern music in a genuinely innovative direction, benefiting us all for centuries. 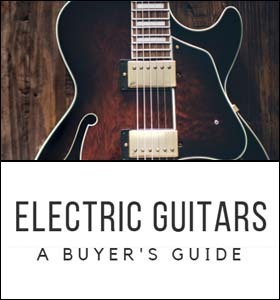 The electric guitar was invented in 1937 when George Beauchamp and Adolph Rickenbacker were awarded the patent for the first guitar with an electric pickup. Los Angeles, California. Beauchamp and Rickenbacker were working in the “Electro String Instrument Corporation” of LA and spent a little over 5 years pursuing their invention . Compared to electric guitars, acoustics have a long and complicated history. In fact, they’ve been around so long that it’s tough to trace the true origin of the first acoustic -- although we can certainly try! 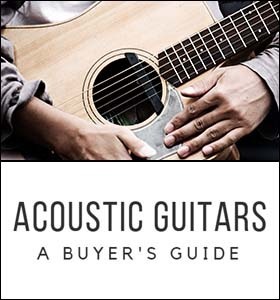 Paul Guy wrote a great handbook  detailing the history of the acoustic guitar; we’ll be referencing his work here for thoroughness. Since acoustic guitars can be traced back over 4,000 years , it’s important to look at the evolution of the guitar as a whole, not just its modern-day equivalent. Modern acoustics only recently appeared in history when compared to the very first string instruments millennia ago. The modern classical guitar was designed by Antonio de Torres Jurado in the mid 1800s . Antonio was a Spanish guitarist and luthier who today is known as one of the most important guitar makers in history. What was his great achievement? Antonio was able to take the modern European guitars of the time and recreate/reform them into that "classical guitar look" we know so well today. 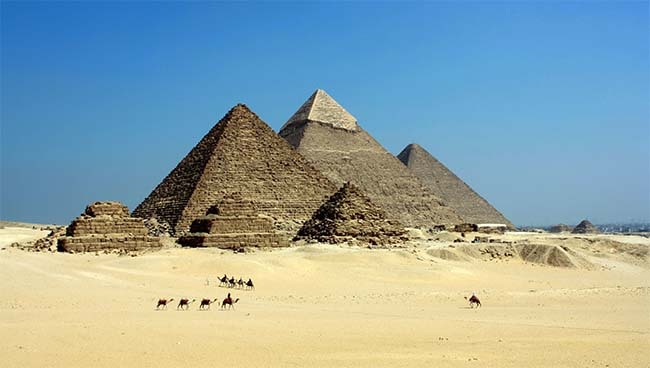 Now let’s look at some more ancient history: Egypt in 1500 BC. If you wanted to see the oldest instrument that looks the most like a guitar, the Archaeological Museum in Cairo has one preserved . This guitar has only three strings and was made of rawhide and polished cedarwood. Oh, it’s also 3500 years old! It belonged to Har-Mose, an Egyptian singer. As we move further along in time across the centuries, we can see guitars beginning to move from four strings, to five, and then eventually to the six-string guitars we play today. 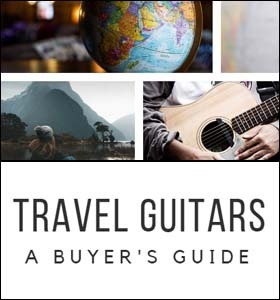 The guitar’s ancestors started in Mesopotamia and Egypt, and then eventually migrated to Europe. At the start of the Renaissance, four-course guitars were dominant across Europe. But the next step up came in Italy during the same period when the first five-course guitar appeared . You might be wondering right now, what exactly is a “four-course” guitar? When we refer to “four-course” guitars, we’re talking about guitars that have 4 pairs of strings, with each pair is tuned exactly the same. This means that a four-course guitar would have 8 strings, tuned like the following (just as an example): D D G G B B E E.
Eventually, during the 17th century, six-course guitars eventually became six-string guitars, and then transitioned into the shape created by Antonio Torres Jurado . This is, of course, a simplified version of the acoustic guitar’s history. If you’d like a more detailed description written by Paul Guy, please reference footnote  below. The first instrument resembling a guitar can be traced back 4000 years to 1500 BC. This was an instrument discovered in the tomb of Har-Mose, an Egyptian singer. Although the history of the acoustic guitar can be traced back thousands of years, a major turning point in modern history was Antonio Torres Jurado in Spain and his creation of the classical guitar shape. Jurado created many of these guitars around the ~1860s, and we still use this shape in our modern acoustic guitars today. This is genuinely interesting stuff that still boggles my mind when I think about it. It’s so hard to imagine that 4000 years ago, there was a civilization that created and played stringed musical instruments. They were people, just like us. They had to eat, they had to entertain, and they had to do life every day just like we do. Sure, there were cultural differences. Of course times have dramatically changed. But at their very core -- at their essence -- these were all just people, just like us! It’s hard to comprehend, but that’s the way of life. Maybe in another 4000 years into the future, we’re going to be yet another ancient civilization with our own secrets to uncover. Until next time -- and good luck on your historical journeys!